When this architectural wonder was completed in 2010, The Box Office was the largest shipping container office building in the United States. And though its claim to fame has recently been usurped by another, the loss does nothing to take away from the funky and unique building you’ve likely seen while driving down Rts. 6 & 10. 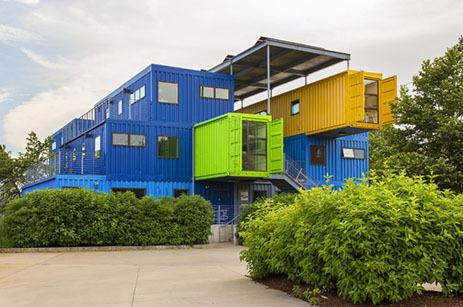 Composed of 37 brightly colored, delightfully oriented and cantilevered shipping containers, the Box Office is a collection of twelve offices and studios that cater specifically to small businesses, start-ups and entrepreneurs. Hard to imagine working in a metal box could be comfortable – hot in the summer, cold in winter, right? Come learn about what makes the building both an energy miser and productive workplace as well. It’s not rocket science, but science nonetheless – an all-electric building that uses air-source heat pumps and energy recovery ventilators for heating, cooling and fresh air. With good insulation and hardly any air leakage, the low energy costs are a plus to the tenants (and the landlord too). Visit this unparalleled upcycled office, and get some inside knowledge on how this building came to be. Explore the suspended walkways and peek inside the offices of both Truth Box and Kelly Taylor Interior Design.